Belgium's PJ Productions has just released a multimedia conversion set for their Mirage IIIE kit ( 721026) or their Mirage IIID kit ( 721029). 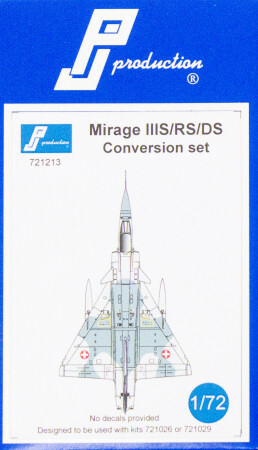 This Mirage IIIS/RS/DS conversion set allows you to render the single seat Mirage IIIS fighter, single-seat Mirage IIIRS reconnaissance, and Mirage IIIDS trainer versions all in service with the Swiss Air Force. This set includes a new cockpit tub and nosewheel well, vertical stabilizer, nosegear strut, Mirage 50-type canards, nose strakes, ventral chaff/flare dispenser, antennas, pitot-static sensors, etc. Everything you'll need to accurately represent the Swiss airframes. This set also includes two noses, one a resin radome for the IIIS and a clear nose for the IIIRS. This latter one is especially nice since you can mask the camera ports and paint the aircraft so when you're finished, the result will look very nice. These conversions from PJ Production are really a nice idea for taking their stock kits and rendering one of many possible Mirage variants that are (or were) in service worldwide. It would be nice to see similar conversions in 1/48 scale to take the Eduard or other Mirage III kits into similar configurations.